Jar City is an Icelandic movie about a murder, the only clue to which is a picture of a headstone of a five year old girl that died 30 years ago. In parallel to that, there is also a story of a genetic researcher whose four year old daughter has just died. How do these stories tie together? That is what makes the movie so intriguing. 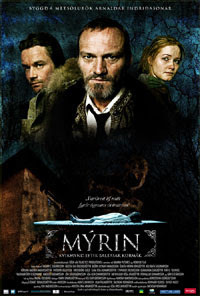 The story structure is such that the lead detective, Erlunder (played compellingly by Ingvar E. Sigurðsson), must investigate a crime from 30 years ago in order to solve the murder he's got on his hands now. Surprisingly, this is done with a bare minimum of flashbacks (I counted two), neither of which are to the original girl's death. The director, Baltasar Kormákur, sets a dreary tone using a muted color palette and wide shots of bleak terrain surrounding the city. The stark architecture only adds to this feeling of despair. A side story of Erlendur's relationship with his drug addicted daughter adds depth to the overall story by fleshing out the point of view character. This is by no means an amazing film, but it is very good. The supporting characters don't stand out much, but rather seem to be foils for Erlendur to play off of. This was apparently based on one of a series of crime novels and I'd be very interested to see adaptations of the others if the story quality is as consistent as this one. Grade: B.
Toodee we reviewee zee moovie from zee iceeland! Bjørk! Bjørk! Bjørk! A loose coalition of comic book fans and friends. United by our mutual desire to rant, rave and otherwise ramble about comic books and their surrounding culture. Can Comic Books Go Green? What's The Buzz on Justice League of America #20?